Travelling the Balkans is a completely unique experience and entirely different from exploring the rest of the Europe. This region has delicious food, interesting history and amazing nature. So, let me tell you all about my favorite gems of nature on the Balkan Peninsula. The Balkans is a term used to refer to the Balkan Peninsula which is home to the Balkan Mountains. This region is located in the Southeast part of Europe and has ten countries within its borders. For those wondering which the Balkan countries are, let me just list them here: Albania, Bosnia and Herzegovina, Bulgaria, Croatia, Greece, Kosovo, Macedonia, Montenegro, Romania, Serbia, Slovenia and Turkey. There are many aspects of travelling the Balkan Peninsula and its countries, as this is a unique region. Lots of different people live there and lots of different languages are spoken. Many of the countries are multicultural, while stories around the world reveal how neighboring countries usually have issues among themselves. Nonetheless, people from the Balkans are also very open and friendly, thus easy to talk to and like. This can easily change after several shots of rakija, which seems to be the holly drink in the Balkans that not only makes people happy, but some even say that it has healing powers. Food, culture and history aside, the Balkans boast with magnificent nature as well. The numerous lakes, waterfalls, caves and canyons are something that must be experienced; especially by nature lovers. If you are a nature lover, then traveling to the Balkans should be on top of your bucket list. There are many memorizing and magical nature spots in the Balkans. Here are some of them to make you want to visit the Balkans. From standalone wonders like the oldest lake in Europe, Lake Ohrid, to beautiful waterfalls like the Plitvice Lakes and the Veliki Slap, the Balkan countries have it all. Let me tell you more about it. Ohrid Lake is one of the deepest and oldest in Europe. This Lake, which lies on the border between North Macedonia and Albania, was declared a World Heritage Site by UNESCO back in 1979 and has attracted thousands of travelers ever since. It’s clear waters, over 200 endemic species and secrets will surely take your breath away. The best way to experience it, when traveling in the Balkans, is by visiting the popular North Macedonian tourist City of Ohrid. Everyone has seen at least one magical photo of Lake Bled and the Bled Island in the middle of it. Well, let me tell you something; in reality it is even more surreal than it seems on the photos. Lake Bled is an amazing spot, but also one that’s filled with tourists. So, you can check out the Bled Castle, take a swim in the lake or simply enjoy the nature; however, you’ll have to share your experience with hundreds if not thousands of other people during summer. On the other hand, Lake Bohinj is located a bit further and part of the Triglav National Park in Slovenia. Being part of a national park prevented the tourist industry and, more importantly, the construction industry to heavily affect the state of the Bohinj Lake. On the contrary, Lake Bohinj has remained a true gem of nature, with natural beaches and lagoons where mostly locals go for a swim. This is the main reason I like Lake Bohinj more than Lake Bled. They are both, nonetheless, quite amazing and worth seeing. Once you reach Lake Bohinj, keep driving for about 20 minutes until you reach the parking lot of Savica Waterfall. Then, prepare yourself for a 30-minute hike (depending on your fitness level you may do it faster or slower) that takes you to an unforgettable view. I must admit that I didn’t plan to visit the Savica Waterfall or Savica Slap at first; it was a last-minute decision to go there. So, this impressive A-shaped waterfall became the best surprise of our summer road trip. You aren’t allowed to go all down to the water and the narrow space dedicated to tourists is crowded; yet, the scenery is simply breath-taking. If you are traveling in Slovenia, then be sure to take the extra drive to Savica Slap and Bohinj Lake not just to Lake Bled. Plitvice Lakes is actually a national park in Croatia. This is a popular tourist spot and a well-known travel destination for anyone traveling through the Balkans. Plitvice Lakes is the largest national park in Croatia and it has been part of the UNESCO World Heritage register since 1979. This site is open throughout the year and it’s always crowded – especially in the summer! This is something to have in mind as I’d advise you to arrive there as early as possible and avoid waiting in line for hours (like we did). The ticket price for Plitvice Lakes varies depending on the season and for adults it goes between 55 and 250 Croatian Kuna (7.5 and 34 EUR). Once inside, visitors can use the organized bus transport as well as boats to reach different points of the Lakes. Naturally, must-see are the many waterfalls, including the Sastavci Waterfalls, the incredible Veliki Slap, Slapovi Milke Trnine and the Galovacki Buk. Each one of these is special and amazing in their own way. Krka National Park is another gem of nature located in Croatia. Even though Krka is not as popular with tourists like Plitvice Lakes is, this place is a must visit. Krka are one of the few waterfalls you can swim in Europe. The Krka National Park entrance fee depends on the season and adults pay between 30 and 200 Croatian Kuna; there are discounts for children and teenagers up to 18 years. Besides the cascading crystal-clear lakes and the numerous Krka Waterfalls, one of the best things here is the Skradinski Buk; this is a natural pool where tourists can actually swim in and worship nature up close. As our itinerary from the Makarska Rivera in Croatia led us towards Mostar in Bosnia and Herzegovina, we accidentally saw a sign for Kravice Waterfalls. Naturally, we had to check out the place, which apparently is popular among tourists and locals as people can swim at the Kravice waterfalls. Kravica is a popular picnic area, thus you can expect to find lots of people there, especially during summer. Cars are parked at a certain spot and afterwards you can either walk down or pay for a train ride (1 euro each way) that takes you to the waterfalls. We chose to walk down to the Kravice Waterfalls but ride up towards the entrance. By the way, the Kravice waterfalls entrance fee was 7 Bosnian Marks per person i.e. around 3.5 EUR. I am a huge fan of caves and while travelling the Balkans I’ve visited three impressive ones. Speaking of amazing caves, one must mention the Postojna Cave in Slovenia. Namely, this is one of the largest and most beautiful caves in Europe and the World. Getting into the Postojna Cave is not cheap as the prices for adults start at 25 EUR and go up to 45 EUR, depending on the package you buy and whether you visit during low or high season. Plus, this adventure may take an entire day as waiting lines are usually huge; so, my advice is to buy tickets online, as this way you will quickly get your tickets and enter the cave, rather than wait for hours and hope that there will be tickets left. Train ride in the Postojna Jama/Cave. Needless to say, Postojna Cave or Postojinska Jama is fascinating; you get inside with a train, you walk inside for about 30 minutes and get to see the endemic species of human fish. The “Pinecone” in Cave Vrelo. Deep into the heart of Canyon Matka is the charming Cave Vrelo. This adventure that includes a 30-minute boat ride and costs 400 MKD promises fun times for both adults and children. This underwater and above ground cave is considered the deepest in the Balkans and you can find out all about Cave Vrelo in my post here. Petralona Cave was the first cave Milena ever visited, and she was outright amazed. This spot is impressive in so many ways, regardless whether you are interested in geology or history. This is where the Petralona Skull was found and where you can see magnificent stalactites and stalagmites. Besides a tour in the cave, there is a local museum to further enrich your experience. Actually, I’ve written all about my Petralona Cave experience here, so feel free to check it out. In any way, if you ever find yourself in Chalkidiki or in Thessaloniki, give Petralona Cave a visit! I’ll keep this brief as I’ve visited only one canyon while travelling the Balkans so far. Naturally, I’m talking about the unique and marvelous Matka Canyon. Generally speaking, the Matka Canyon is located in North Macedonia and it is the home of the Matka Lake, numerous monasteries as well as hiking trails. Also, important is the fact that one of its top attractions is the Cave Vrelo mentioned above. Those interested in finding out more about the canyon should check out my ultimate Canyon Matka guide. I’m sure there are hundreds of wonderful beaches throughout the Balkan Peninsula. After all, the Balkan countries have access to the Adriatic Sea, the Ionian Sea, the Aegean Sea and even the Black Sea. With this in mind, crystal-clear waters and sandy beaches are quite expected. So far, I’ve mostly enjoyed the beaches in the mainland of Greece, but I also visited several coastal towns in Croatia too. It’s hard to choose personal favorites as Greece only boasts with tens of breath-taking beaches such as Portokali Beach or Karydi Beach. Therefore, I’ll let you discover on your own and invite you to share your findings with me in the comment area. 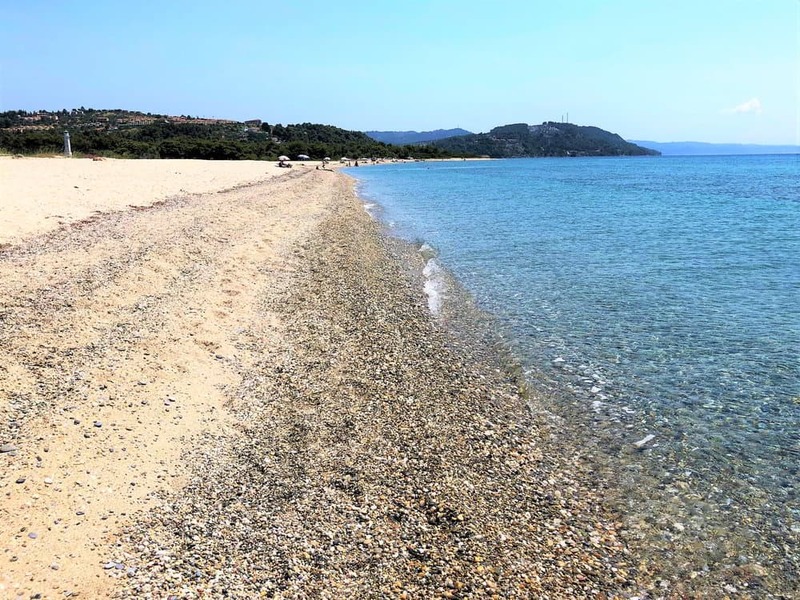 But, here are two beaches in the Chalkidiki peninsula in northern Greece that have left an impression on me and are absolutely perfect for nature lovers. Possidi Beach and the Lighthouse. The sandbar at Possidi cape. Poseidon’s Cape or Possidi Beach is located by the town Possidi in Greece on the first peninsula in Chalkadiki- Cassandra. This beach is actually a sandbar that stretches into the sea and its shape changes depending on the level of the sea. Possidi beach is perfect for sunset views, sunbathing, and swimming. It’s unorganized, so nature lovers will love the untouched nature around them while enjoying the fine, white sand and tranquil, clear sea in front of them. Also, the Possidi Lighthouse and ruins of the Poseidon’s temple are located near for those that love exploring, lighthouses and history. So, if you are on a road trip traveling in the Balkans, then be sure to visit Poseidon’s Cape. Glarokavos Beach is not for everyone, but if you are travelling the Balkans this is one beach to visit in Greece. It’s a true nature gem that I wish the Greek government would protect. It’s also located on the Kassandra peninsula, but on the other side of it near Pefkochori, Greece. The Glarokavos Bay is actually a marina port for yachts and smaller boats. The beach however, extends on both sides of the opening to the bay, offering pristine sand and beautiful turquoise sea. The evergreen and pinewood trees offer natural shade and unforgettable view. As this beach is also unorganized it’s the perfect place for campers and nature lovers. However, as I said before, I really would hope the Greek government would step in and protect the beaches around Glarokavos. 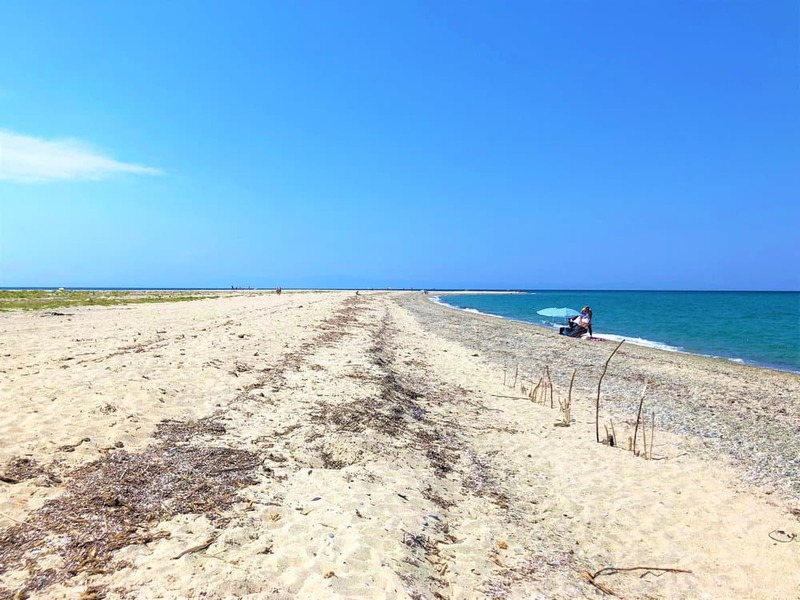 The Glarokavos beach is a well-known spot for campers, and with nowhere to properly dispose of the trash, the pinewood forest around the beach is filled with garbage. Croatia is one of the top summer destination spots in Europe, even among celebrities. It just so happened that Oprah Winfrey was in Dubrovnik during our road trip around the Balkans in the summer of 2018. The Adriatic coast in Croatia has many magnificent beaches to visit. 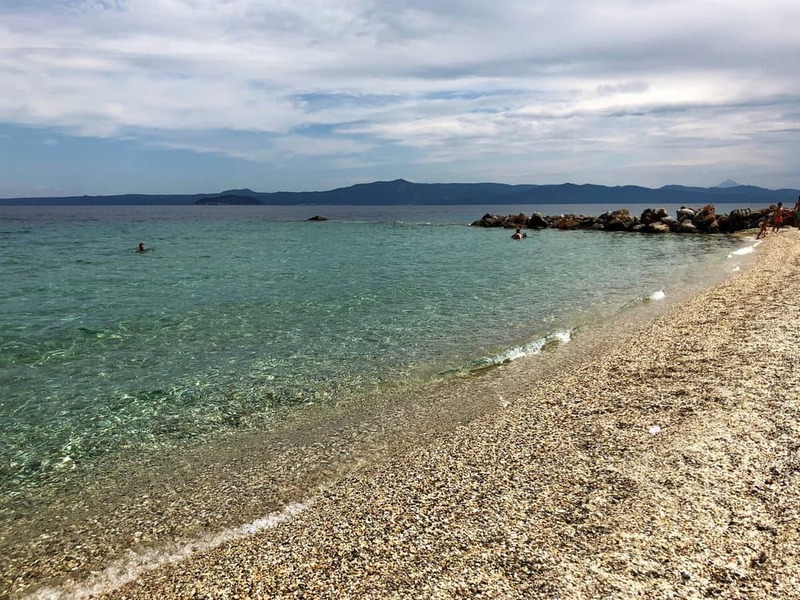 On our trip, we took a swim in a beach near Trogir, and spent a few days enjoying the crystal clear waters of Podgora. 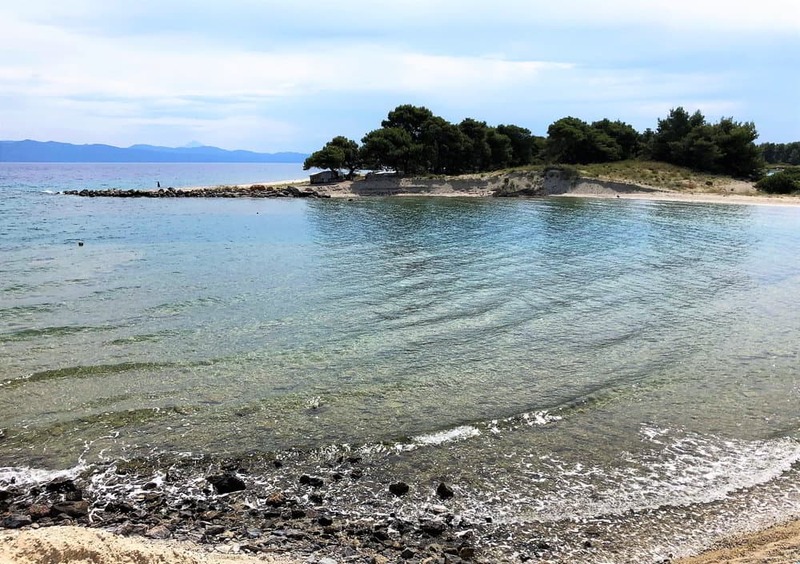 The Makarska Rivera is also another popular spot for those that love swimming, sunbathing, snorkeling, parasailing, and other water sport activities. before heading out to Croatia, since the beaches in Croatia are mostly made up of rocks. Travelling the Balkans is quite the unique experience, even for something who originates from the region. Whenever you plan to come here, in any or all of the Balkan countries, prepare yourself for a cray ride, tasty food and lots of positive energy. Moreover, pack all your favorite hiking equipment as this region is a paradise for nature lovers. With numerous lakes, waterfalls, caves and mountains waiting to be explored, it’s likely you’ll always be on the move looking for yet another gem of nature to amaze you.